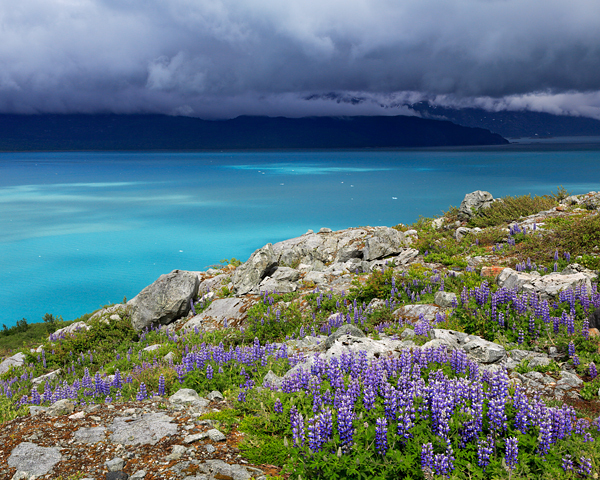 Lupines over the unbelievably blue water of the West Arm of Glacier Bay National Park, Alaska. The floating white dots are icebergs from the Johns Hopkins and Margerie glaciers. This photograph will be part of a traveling show in 2014 celebrating the 50th anniversary of the Wilderness Act. After the show, this photograph will be on permanent display at Glacier Bay National Park. Photographed during my Artist in Residency at Glacier Bay National Park. For funding my stay, I am very grateful to the National Park Service, Alaska Geographic, and the Voices of the Wilderness program.